For the clothing company, see Prana (brand). For the band, see Prana (band). In Hindu philosophy including yoga, Indian medicine and Indian martial arts, prana (प्राण, prāṇa; the Sanskrit word for "life force" or "vital principle") permeates reality on all levels including inanimate objects. In Hindu literature, prana is sometimes described as originating from the Sun and connecting the elements. Five types of prana, collectively known as the five vāyus, are referred to in Hindu texts. Ayurveda, tantra and Tibetan medicine all describe praṇā vāyu as the basic vāyu from which the other vāyus arise. The mudras of hatha yoga served to trap prana, helping to unblock the central sushumna channel, so enabling kundalini to rise up the channel, leading to moksha, liberation. The ancient concept of prana is described in many Hindu texts, including Upanishads and Vedas. One of the earliest references to prana is from the 3,000-year-old Chandogya Upanishad, but many other Upanishads use the concept, including the Katha, Mundaka and Prasna Upanishads. The concept is elaborated upon in great detail in the literature of haṭha yoga, tantra, and Ayurveda. The Bhagavadgita 4.27 describes the yoga of self-control as the sacrifice of the actions of the senses and of prana in the fire kindled by knowledge. More generally, the conquest of the senses, the mind, and prana is seen as an essential step on the yogin's path to samadhi, or indeed as the goal of yoga. Thus for example the Malinivijayottaratantra 12.5–7 directs the seeker "who has conquered posture, the mind, prana, the senses, sleep, anger, fear, and anxiety" to practise yoga in a beautiful undisturbed cave. Prana is typically divided into constituent parts, particularly when concerned with the human body. While not all early sources agree on the names or number of these divisions, the most common list from the Mahabharata, the Upanishads, Ayurvedic and Yogic sources includes five classifications, often subdivided. [page needed] This list includes prana (inward moving energy), apana (outward moving energy), vyana (circulation of energy), udana (energy of the head and throat), and samana (digestion and assimilation). Early mention of specific pranas often emphasized prāṇa, apāna and vyāna as "the three breaths". This can be seen in the proto-yogic traditions of the Vratyas among others. Texts like the Vaikānasasmārta utilized the five pranas as an internalization of the five sacrificial fires of a panchagni homa ceremony. Similar concepts exist in various cultures, including the Latin anima ("breath", "vital force", "animating principle"), Islamic and Sufic ruh, the Greek pneuma, the Chinese qi, the Polynesian mana, the Amerindian orenda, the German od, and the Hebrew ruah. Prana is also described as subtle energy or life force. One way of categorizing prana is by means of vāyus. Vāyu means "wind" or "air" in Sanskrit, and the term is used in a variety of contexts in Hindu philosophy. Prāṇa is considered the basic vāyu from which the other vāyus arise, as well as one of the five major vāyus. Prāṇā is thus the generic name for all the breaths, including the five major vāyus of prāṇa, apāna, uḍāna, samāna, and vyāna. The Nisvasattvasamhita Nayasutra describes five minor winds, naming three of these as naga, dhanamjaya, and kurma; the other two are named in the Skandapurana (181.46) and Sivapurana Vayaviyasamhita (37.36) as devadatta and krtaka. Prāṇa The exhaled breath (pra - "outward", "forth") which lives in the lungs. Apāna Down and outward energy, most notably the elimanatory systems. It resides in the hips and gut. Uḍāna Rising energy, resident in the throat, but also responsible for lifting kuṇḍalinī. Sound production through the vocal apparatus, as in speaking, singing, laughing and crying. Samāna The heat of digestion, which resides in the belly between prāṇa above and uḍāna below. Vyāna The energy of circulation that resides throughout the body. Indian philosophy describes prana flowing in nadis (channels), though the details vary. The Brhadaranyaka Upanishad (2.I.19) mentions 72,000 nadis, running out from the heart, whereas the Katha Upanishad (6.16) says that 101 channels radiate from the heart. The Vinashikhatantra (140-146) explains the most common model, namely that the three most important nadis are the Ida on the left, the Pingala on the right, and the Sushumna in the centre connecting the base chakra to the crown chakra, enabling prana to flow throughout the subtle body. When the mind is agitated due to our interactions with the world at large, the physical body also follows in its wake. These agitations cause violent fluctuations in the flow of prana in the nadis. The word Prāṇāyāma derives from the Sanskrit words prāṇa and ayāma, translating as "life force" and "expansion", respectively. It is a common term for various techniques for accumulating, expanding and working with prana. Pranayama is one of the eight limbs of yoga and is a practice of specific and often intricate breath control techniques. The dynamics and laws of Prana were understood through systematic practice of Pranayama to gain mastery over Prana. Many pranayama techniques are designed to cleanse the nadis, allowing for greater movement of prana. Other techniques may be utilized to arrest the breath for samadhi or to bring awareness to specific areas in the practitioner's subtle or physical body. In Tibetan Buddhism, it is utilized to generate inner heat in the practice of tummo. In Ayurveda and therapeutic yoga, pranayama is utilized for many tasks, including to affect mood and aid in digestion. A. G. Mohan stated that the physical goals of pranayama may be to recover from illness or the maintenance of health, while its mental goals are: "to remove mental disturbances and make the mind focused for meditation". 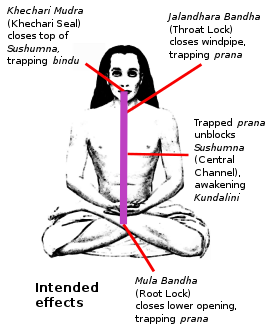 According to the scholar-practitioner of yoga Theos Bernard, the ultimate aim of pranayama is the suspension of breathing, "causing the mind to swoon".Swami Yogananda writes, "The real meaning of Pranayama, according to Patanjali, the founder of Yoga philosophy, is the gradual cessation of breathing, the discontinuance of inhalation and exhalation". ^ "Prana". Dictionary.com. Retrieved 2015-04-22. ^ 1925-1996., Rama, Swami (2002). Sacred journey : living purposefully and dying gracefully. India: Himalayan Institute Hospital Trust. ISBN 978-8188157006. OCLC 61240413. ^ Swami Satyananda Saraswati (September 1981). "Prana: the Universal Life Force". Yoga Magazine. Bihar School of Yoga. Retrieved 31 July 2015. ^ Mallinson, James (2007). The Shiva Samhita: A Critical Edition and an English Translation (1st ed.). Woodstock, New York: YogaVidya.com. ISBN 978-0971646650. ^ Mallinson & Singleton 2017, p. 25. ^ Mallinson & Singleton 2017, p. 47. ^ a b Mallinson & Singleton 2017, p. 60. ^ Sivananda, Sri Swami (2008). The Science of Pranayama. BN Publishing. ISBN 978-9650060206. ^ Eliade, Trask & White 2009, p. 104. ^ Eliade, Trask & White 2009, pp. 111–112. ^ Feuerstein, George (2013) . The Yoga Tradition: Its History, Literature, Philosophy and Practice. (Kindle Locations 11769-11771): Hohm Press. ISBN 978-1935387589. ^ Srinivasan, TM (2017). "Biophotons as subtle energy carriers". International Journal of Yoga. 10 (2): 57–58. doi:10.4103/ijoy.IJOY_18_17. ^ Rowold, Jens (August 2016). "Validity of the Biofield Assessment Form (BAF)". European Journal of Integrative Medicine. 8 (4): 446–452. doi:10.1016/j.eujim.2016.02.007. ^ Mallinson & Singleton 2017, pp. 128, 173–174. ^ Mallinson & Singleton 2017, p. 174. ^ a b c d Mallinson & Singleton 2017, pp. 172–173. ^ Sridhar, M. K. (2015). "The concept of Jnana, Vijnana and Prajnana according to Vedanta philosophy". International Journal of Yoga: Philosophy, Psychology and Parapsychology. 3 (1): 5. doi:10.4103/2347-5633.161024. ^ Nagendra, H. R. (1998). Pranayama, The art and science. Bangalore, India: Swami Vivekananda Yoga Prakashana. ^ Ra Yeshe Senge (2015). The All-Pervading Melodious Drumbeat: The Life of Ra Lotsawa. Penguin. pp. 242 see entry for Tummo. ISBN 978-0-698-19216-4. ^ Dharmakirti (2002). Mahayana tantra: an introduction. Penguin Books. pp. 126–127. ^ Mohan, A. G.; Mohan, Indra (2004). Yoga Therapy: A Guide to the Therapeutic Use of Yoga and Ayurveda for Health and Fitness (1st ed.). Boston: Shambhala Publications. p. 135. ISBN 978-1590301319. ^ Bernard, Theos (2007). Hatha Yoga: The Report of A Personal Experience. Harmony. p. 57. ISBN 978-0-9552412-2-2. OCLC 230987898. ^ Yogananda, Paramahansa (2005). The Essence of Kriya Yoga (1st ed.). Alight Publications. p. part10 (online). ISBN 978-1931833189. Eliade, Mircea; Trask, Willard R.; White, David Gordon (2009). Yoga: Immortality and Freedom. Princeton University Press. ISBN 978-0691142036. Look up prana in Wiktionary, the free dictionary.